Fig. 67 Biramous appendage . 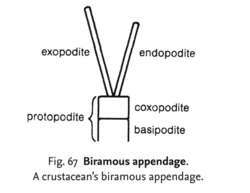 A crustacean's biramous appendage. the forked appendage of CRUSTACEANS formed by the protopodite (coxopodite and basipodite) which is nearest the body, and the two branches, exopodite and endopodite, which may form pincers, mouthparts or legs.